Intensive care units (ICUs) are highly complex environments where treatments are adjusted frequently to accommodate changes in patients’ conditions. The current state of information overload in the ICU is overwhelming human cognitive capabilities to cope with the data volumes or to visualize complex correlations among the data. The inability to synthesize this data is borne out by the fact that patient outcomes have failed to improve despite the use of sophisticated monitors that produce highly relevant information that could improve decision making. This failure is related primarily to the inability to acquire and aggregate the sheer volume and velocity of data, and to transform this data into meaningful insights. The goal of intensive care practitioners is to identify those patients whose conditions are registering subtle signs of deterioration. Their challenge is to achieve this insight with immediacy. 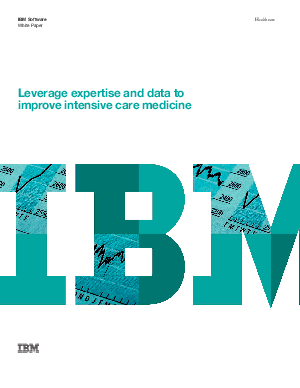 The impact of streaming analytics in healthcare cannot be overestimated; it has the potential to fundamentally change the way intensive care medicine is practiced, improving both efficiency and patient outcomes.